In 1875, Samuel Clemens's niece Annie Moffett, the daughter of his only sister Pamela, married Charles Webster. Webster was a native of Fredonia, New York and would later became Clemens's business manager for Webster Company publishers. In March 1881 Clemens, who was prone to invest in business schemes that failed, was persuaded by Charles Webster to buy stock in the Independent Watch Company, later known as the Fredonia Watch Company. The company was owned by Edward D. Howard who was born about 1842 and his brother Clarence M. Howard who was born about 1851. Another brother Frank Howard, born about 1845, may have also been involved in the company. The Howard brothers were residents of Fredonia, and in the 1880 census the occupations of Edward and Clarence were listed as manufacturers of proprietory medicines -- patent medicine salesmen. Brother Frank Howard held the occupation of a jeweler. The Howard brothers convinced numerous citizens in Fredonia, including Clemens's sister Pamela, to invest in their watch company. The Howards soon recruited Charles Webster to approach his famous uncle to also invest in the company and ask his consent to name a watch movement after him -- the Mark Twain watch which was later produced in 1882. Webster succeeded in his endeavor and Clemens bought about $5,000 worth of stock in the company. I desire to sell $5,000 of stock in the Independent Watch Co., of Fredonia, N.Y. Lest the possible purchaser pay too much & afterward upbraid me, I will lay the facts bare before him; then he can buy wittingly. S. L. CLEMENS, (Mark Twain) HARTFORD, CONN.
- from Mark Twain, Businessman, edited by Samuel Webster, pages 198-199. Webster, however, preferred to deal with the Howard brothers in person. He did not place Clemens's ad in the papers. Instead, he negotiated a note in Clemens's favor to recoup his investment as well as the return of Pamela Moffett's investment. Clemens was pleased with Webster's miraculous rescue of the family funds from "the Watch thieves" as he referred to them. A few specimens of the Mark Twain watch survive and are highly prized collectibles by Twain enthusiasts. Mark Twain watch from the Dave Thomson collection. 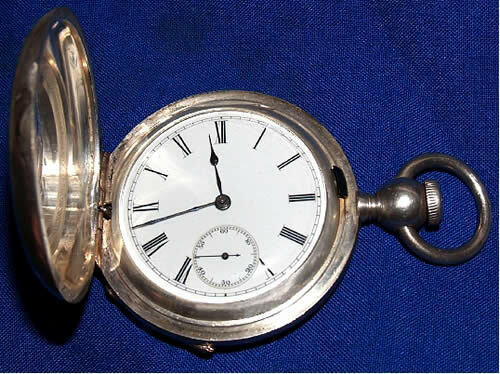 This specimen of the Mark Twain watch measures 3.5 inches from the top of the "loop" to the bottom of watch. The diameter of body is 2.30 inches and thickness is .75 inches. The watch has a smooth silver finish with small engraved details on both sides at top, bottom and center. The crystal is 1.8 inches in diameter. The inside of both case lids is stamped WARRANTED COIN SILVER The serial number of this watch is 8324. The inner lid on back of the watch covers the movement and has a hole in it which provides access to a gear to set time and/or wind. This particular watch is "frozen" and not running so function is not readily apparent. 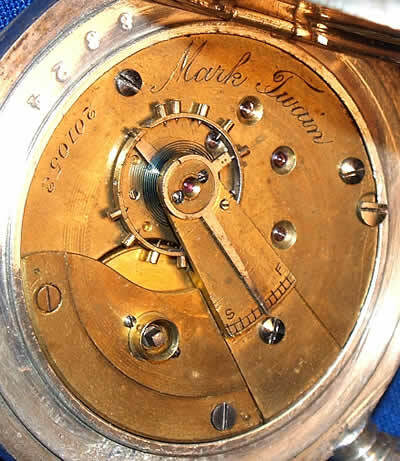 The internal brass movement is engraved "Mark Twain" in script and bears the number 207053. According to watch enthusiast Jack Kennedy, the Mark Twain watch would be described in horology terms as: 18 size, Hunter case, 11 jewel full-plate movement with key wind and key set. The inner cover is known as a cuvette and was standard for watches requiring a key for keeping dust and moisture out of the movement. The Complete Price Guide to Watches by Cooksey Shugart has a brief history of the company with a blurb regarding the introduction of the Twain watch. Shugart lists a mint-condition Twain watch as being worth about $2700 in 2003. Kennedy, Jack. Personal email correspondence, 01 Oct 2007.